I hope everyone had a great weekend. Mine was fabulous! Don was home all weekend long...something that we haven't had ALL summer long! Usually, he is up and out of the house well before I can even think about opening my eyes. It was really nice to open my eyes and see him next to me...for two days in a row no less! Adam and I went to the mall and finished up school shopping for him. The boys have one more week before they start back to school. I've already started with my PTA stuff and been up to the school a couple of times in the past week. I'm looking forward to getting back into a daily routine. With the two businesses, I need those quiet hours to get things done. Enough rambling....on with the card! Yes...I'll say it again...it's never too soon to get started on your Christmas cards and projects! Here's a super quick card that is sure to please! This card uses Very Vanilla card stock for the base and the framed panel. For the panel, I cut my card stock to 3-5/8" x 4-1/2". 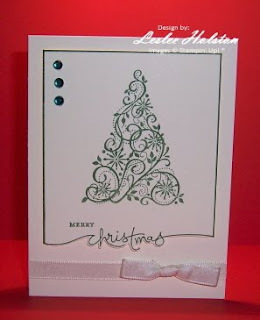 "Christmas" is stamped in Garden Green by markering just it from the stamp found in the Heard From the Heart set. I trimmed just below that and then markered around the edge to create the frame. I markered "Merry" from Teeny Tiny Wishes. No one said that you can't mix and match your sentiments. I happen to like the difference in fonts. The tree is from the Snow Swirled set. The three emerald Fashion Jewels just seem to balance the entire frame out. The panel is up on Dimensionals. I adhered a length of Very Vanilla Taffeta ribbon to the bottom of the card base. What do you think? Ready to get started on your holiday cards? I sure hope you've been inspired! Thanks for stopping by. Coming this week...the new Serene Snowflakes, found in the Holiday Mini catalog that will be released on September 1st. I have used one snowflake...four different ways. Check back all week to see how.